Ice machine empty, TV not so good...poor sound. Otherwise a good value hotel! Staff was very friendly and accommodating. There was a fraternity party going on and we got upgraded to a beautiful quiet room at the Cedar Lidge without asking. Thank you! Where to find Port Franks hotels near an airport? Where can I find hotels in Port Franks that are near tourist attractions? There are only a handful of hotels to choose from within an easy walk from the center of Port Franks. The Bee 'n Bee Bed n' Breakfast is a good choice as it's only 3 kilometres (2 miles) away. The Brentwood on the beach as well as the Country Side Motel are good options to investigate. The Brentwood on the beach is situated 25 kilometres (16 miles) away from the middle of Port Franks. The Country Side Motel is situated 30 kilometres (20 miles) away. Another great options is to investigate booking a room the Bee 'n Bee Bed n' Breakfast. It is 1 kilometre (1 mile) from the middle of Port Franks. If you have time, you might like to visit other parts of Southern Ontario. Southern Ontario is marked by beaches, coastal plains and forests. Commonly visited Southern Ontario tourist destinations include traditional villages. Active travelers might enjoy skiing, cross-country skiing and snow shoeing in this part of Canada. Downtown London is 60 kilometres (37 miles) to the southeast of Port Franks and is home to the London Convention Center and Jonathon Bancroft-Snell Gallery. Expedia-listed Downtown London hotels are the Residence Inn by Marriott London Ontario and Best Western Plus Lamplighter Inn & Conference Centre. 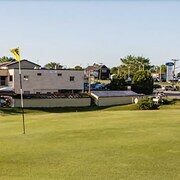 60 kilometres (36 miles) to the north of Port Franks, you can also stay at Goderich, which is home to the Benmiller Inn & Spa and Samuel's Boutique Hotel. While in Goderich, be sure to check out the Livery Theatre and Huron County Museum. Before you say goodbye to Southern Ontario, make sure you experience local game. Visit RBC Centre to the southwest of Port Franks. 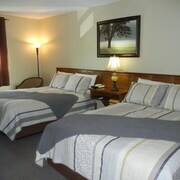 Sleep near the action at the Fauld's Motel or the The Gables inn. Chris Hadfield Airport is 40 kilometres (26 miles) from Port Franks. Visitors who wish to stay nearby, you can easily secure a room at the Howard Johnson Inn Sarnia or the Palace Inn Motel. What are the most popular Port Franks hotels? Just a Minute's Stroll From one of the Best Beaches in the World! 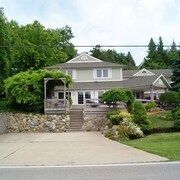 Beautiful Three Bedroom Rental in the Heart of Grand Bend Village!!! Are there hotels in other cities near Port Franks? 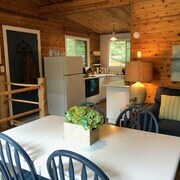 What other types of accommodations are available in Port Franks? Explore Port Franks with Expedia.ca’s Travel Guides to find the best flights, cars, holiday packages and more!